Pro-Russian rebels in eastern Ukraine say they have agreed to postpone until February disputed elections that had been planned for the next few weeks. The move was announced by two senior separatist representatives of the self-proclaimed republics in the Donetsk and Luhansk regions. Kiev says any polls held not according to Ukrainian law would be "fake". The disagreements have hindered progress towards ending the conflict in which nearly 8,000 people have died. Moscow denies sending troops and heavy weapons to the separatists. However, the Kremlin admits that Russian "volunteers" are fighting alongside the rebels in the Donetsk and Luhansk regions. The fighting erupted in April 2014, a month after Russia annexed Ukraine's southern Crimea peninsula. 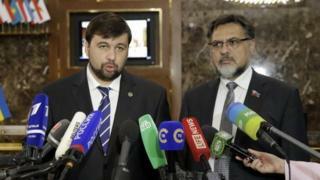 Rebel representatives Denis Pushilin and Vladislav Deinego announced the move in a statement published on the separatist DAN news agency. They said the elections - which had been originally planned on 18 October in Donetsk and 1 November in Luhansk - would be delayed until 21 February 2016. In return, the rebels said the government in Kiev must fulfil its responsibilities in accordance with a peace deal agreed in Minsk, Belarus, last February. They said this included a special status to the rebel-held areas, constitutional changes and an amnesty. The rebel announcement comes just days after the leaders of Ukraine, Russia, Germany and France discussed key elements of the Minsk agreement in Paris. After the talks, French President Francois Hollande stressed that any elections in the east must be held according to Ukrainian law. Ukrainian President Petro Poroshenko said the four leaders at the Paris talks had supported the idea of the elections based exclusively on Ukrainian legislation and in the presence of international monitors from the Organization for Security and Co-operation in Europe (OSCE). Russian President Vladimir Putin is said to have agreed to use his influence to not allow the election to take place. The postponement of elections will be seen as another positive step towards a lasting peace agreement, the BBC's Tom Burridge in Kiev reports. On Saturday, Ukrainian government forces and the rebels in Luhansk said they had begun withdrawing weapons with less than 100mm (4in) calibre from the line of contact. The Donetsk rebels were quoted as saying that they would start pulling out their weapons on 18 October. The withdrawal process is yet to be verified by OSCE monitors. A ceasefire in eastern Ukraine has been largely holding since September despite reports of occasional shelling.